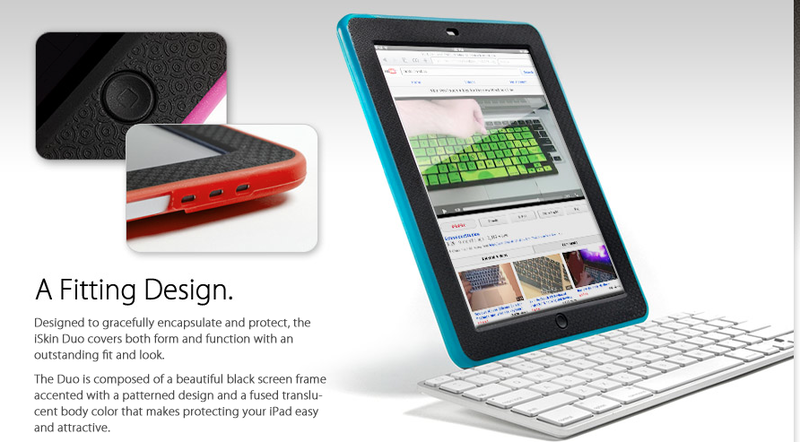 There are a variety of reasons to have your iPad wrapped in a case. Some people can’t carry the thin/smooth device without some level of protection for grip or fingerprints on the screen. Others need to protect the device against bumps and small drops. 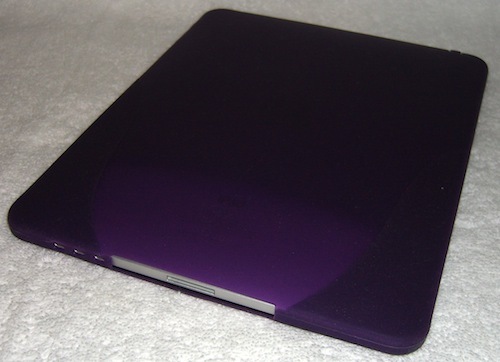 Cases can be sleeves, that only function to protect the iPad when not in use. 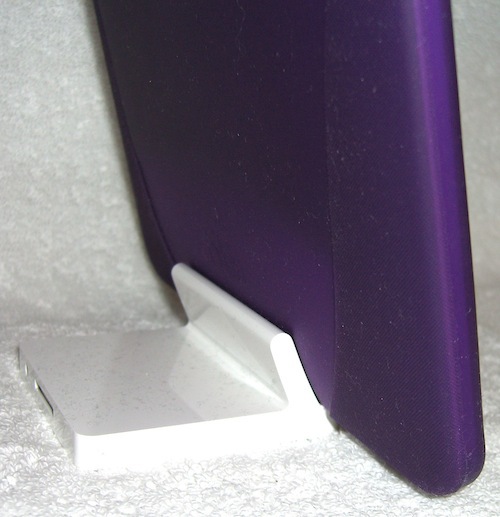 Most popular around the office is book like cases that open to allow access to the screen without the need to remove the device from the casing. Finally, there are rubber like cases that protect the back and give the device a level of comfort for those that have a hard time not dropping things, just a bit easier to hold onto. 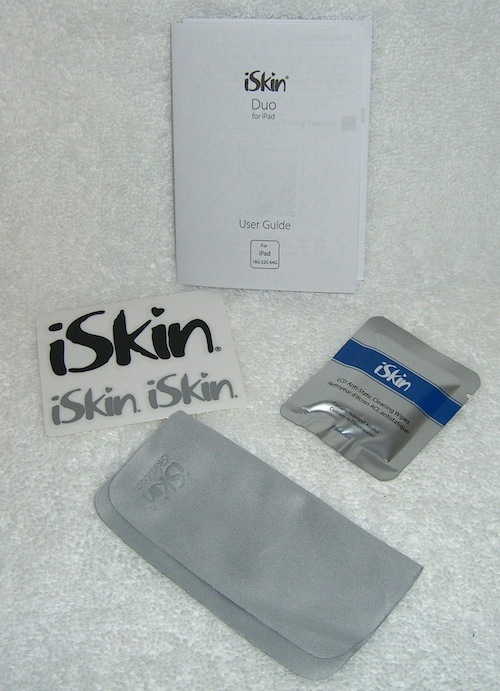 iSkin has introduced a ‘Duo’ line of cases that are the last mentioned above, a rubbery skin that wraps around the back. An additional feature of the Duo (outside of the fun colors) is that it wraps all the way around to cover the iPad face of the screen that is not used. Covering all buttons and switches too… suddenly, the iPad is happy in the hands of kids and around the kitchen! And that discovery is why one particular to our house got ‘stolen’ off our a work iPad and showed up on the iPad used around the house. The edge of the case that wraps onto the face does a very nice job of sealing to the screen to protect against little hands resting on the edges and dirty fingers holding while they eat popcorn watching Netflix. Kit comes with a chemical cleaning pad and a cleaning cloth to prep your iPad screen. Headphone/speaker out opening has a plug style part of the case to seal when not in use. Side volume rocker is covered, with the screen lock slider switch open to use. The internal speaker and the dock plug is left uncovered. 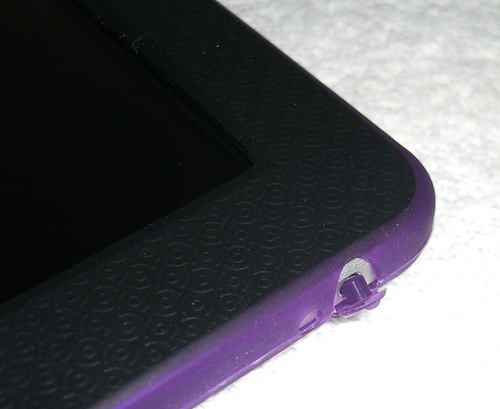 The robber over the area above the dock plug is thin enough to allow the use of a iPad Dock without removing the Duo case. We will report back shortly if we start to notice the rubber start to bend out or tear. iPad with Duo case in a Doc. Notice that the back of the case is slightly thicker and ‘rougher’ along the outer/lower edges making it less slippery to hold in one hand. The viewable part of the screen is completely visible yet there is still corner and edge protection. The home button is also covered.